If you were managing a young "startup" company you would be aware of "The "Lean Startup Movement" - a concept for refining objectives of small companies who are trying to "change the world" developed by a smart chap called Eric Ries. I have argued before this puts energy managers into a context that is rather like entrepreneurial development. By definition you will not succeed ! Written like this, it sounds like a thankless and futile life, but it is not. What matters is not only improvement and enhancement, but the management of things that slip backwards and elimination of things that do not work. You are in the midst of a circular process, which we can look at in a minute, and trying to find better ways of solving existing energy related problems. (i.e. disruptive innovation). You reject the "its always been done that way" argument - you seek change. Secondly - Some things do go wrong, (that's a part of life), but the energy manger responds. And Third - Some initiatives work. There are things that might take off, could be rolled-out. but need a development process, budgets and a management process ( a business model). Inshort these incubated ideas need nurturing (very much as an investor backs a small startup which shows some chance of rewards). How does this look like founding a business ? A business that does not have enough cash goes out of business, and a small company starts with very little cash. 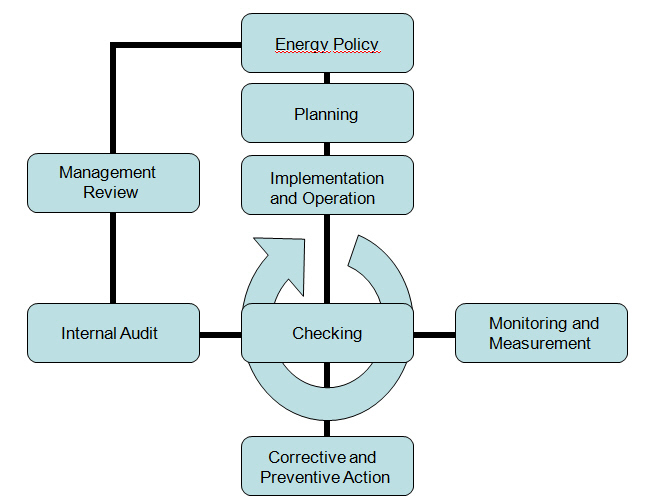 An energy management project is the same (examine it, try it, see if it flies, if it does roll it out, but if it doesn't kill it fast and move the budgets to some possibly better alternative. A business is like a series of experiments ("I think this will sell", "let's try offering this", "maybe people will come back if we"). These experiments succeed or fail. Like you the startup company has limited resources - if it is going to fail, you need to "fail fast", that is to say stop digging! In the startup world this is followed by a "pivot" - ie a change or improvement in direction. The very same is true of an energy manager, you have limited social capital, credibility or funds, and when these dry up you are out of business (literally and perhaps in a very personal and painful way). Why does intelligence matter ? Measurement (against expected targets) is the only way of knowing if it is working. It amazes me when an energy manger is conned into buying some "snake-oil" product and rolls these out because the salesman "promised it worked". We have seen this in the biggest engineering companies of the world, in the smartest money hungry companies, and in highly respected research establishments. Honestly, when someone finds a way of getting more calories out of a drop of oil by waving magnets, crystals or pyramids over it, I will hang up my hat - Meanwhile the laws of Physics Rule! So every experiment (or hypothesis) regards how you will save money should have some acid test. You need to know if it works (in hindsight - not whether you believed at the outset - we can all convince ourselves). Proverbs 26:11 tells us: "As a dog returneth to his vomit, so a fool returneth to his folly." (King James). Whether you believe in something or not initially, if it does not work - don't do it. It is far easier to keep trying something that you once believed in. But that is foolish. So the best approach is to define your criteria for success up front. Then test, test, test. And if it works refine, refine, refine. And if it doesn't reject and move on. Failing fast, is not only about noticing the sooner you stop digging the less it hurts. It is also about recognizing that you have a limited time (runway in startup parlance) before your money or resources run out, and you can only bankroll a limited number of experiments. Going to corporate finance with a plan is much easier if you stopped the financial haemorrhages that did not work, before the well ran dry. More importantly failing fast is a mind set. If you get stuck in a rut, momentum builds up and its much harder to stop the runaway. So the key idea of fail-fast is to learn at the earliest possible opportunity, with least possible cost when to change track. For convenience I have repeated the chart here. 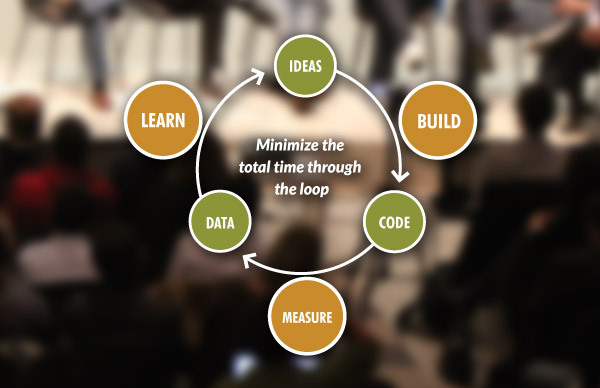 For me the most telling words are those in the middle of the lean-startup movement diagram. "Minimize the total time through the loop"